Having discussed the issues with current charity/fundraising platform in Part 1, I am going to present my idea for a new charity platform. Right now the idea is theoretical but I plan on building this in the very near future. The reason I started with a list of guiding principles is that I think these challenges have to be met to make a successful alternative to the current systems available. To build an alternative method of generating money. Some of you may know that I am quite interested in how money works and would really like to see systemic change to much of our fractured money supply. It has also helped me though to think through the problem of how to let contributors give cash without giving cash (sadly we are not allowed to expand the money supply ourselves). The answer I believe is to create a kind of market place. A good old fashioned market place where people exchange stuff for other useful things. The idea is simple and is essentially a different form of crowdfunding. A charity and a donor run an online campaign. The campaign has a funding target (e.g. £10,000) to be reached by a deadline. The campaign consists of videos about both the charity and the donor. Each video has a financial value attached to it for a completed viewing e.g. 50p. These videos teach the fundraisers about the charity and also act as advertising as well as positive brand association for the donor. Fundraisers (users) simply watch the videos. Every time a fundraiser views a video completely they add its value e.g. 50p, onto the current tally. If the funding target is reached before the deadline has passed then the donor gives the charity the full sum of the funding target (e.g. £10,000 - equating in this instance to 20,000 fully completed video watches). That’s it. It’s as simple as that. So why would anyone want to use it? Let’s look at the three parties involved in a campaign to get a better understanding of what they each get and what they each give. Hey otherwise it would’t be a market place! What does the charity get from the platform? From the fundraising activity the charity receives a donation (or multiple donations). That much is obvious. But importantly they are also marketing themselves and their work to lots of people. No more will users simply just see their logo or link to their website, they will be actively raising money by learning more about the charity. In turn fundraisers may also want to give additional money personally to the cause. Often the money being raised for the charity is spent on marketing activity anyway, so couldn’t that money be put to better use? If you can incorporate the fundraising and awareness activities at the same time then the donations can be spread further. What does the charity have to do in exchange? Well like all good crowdfunding platforms it comes down to the donee to market their campaign properly. This mean formulating a great campaign, aligning with suitable donors, working out the perfect blend of charity/donor marketing, producing engaging content, getting the work out to as many people as possible etc. All the usual requirements for running any successful crowdfunding campaign. After all it is in the charities best interest to get as many eyes on their campaign as possible to smash their target as soon as possible. What does the donor get from the platform? Often companies give to charity anyway, some larger companies even have corporate social responsibility arms that actively work on aiding society. The benefits vary dependent on who the donor is, but in general the return for the donor is twofold. Not in the “Come buy my product” type of advertising, but as in “Look at the great work we do with X” type of way (of course it could just be “Come buy me” but I would imagine this would have a lower impact on point two below). Usually dictated purely by the advertising budget, donors will receive a large amount of dedicated, completed views of their video(s) in exchange for a (usually tax deductible) charity contribution. Can’t be bad huh? By setting the value of each video they can effectively use going market rates for CPCV (cost per completed video) and in effect receive free advertising. Two - Positive brand association. This is all about the positioning of the donors brand. By aligning themselves with a good cause they will help increase their brand’s positive sentiment from the fundraisers. This is not supposed to sound like a cheap bit of advertising by hoaxing users. I believe that it is the responsibility of companies and/or those with more capital to use some of their profits/wealth to improve the world for all. That’s a push towards a healthier capitalism. 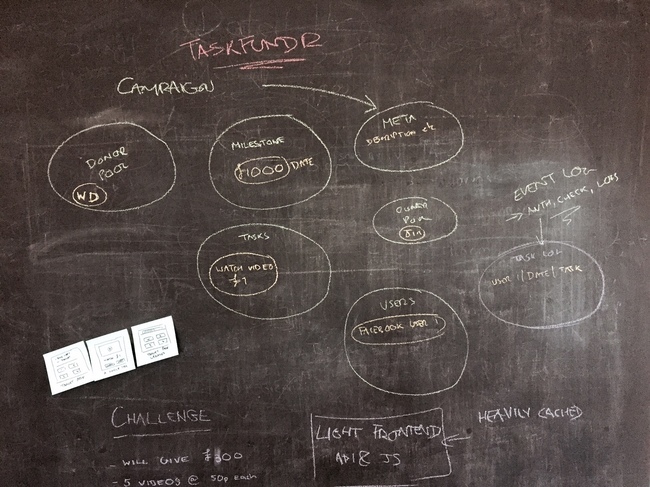 What does the fundraiser get from the platform? Helping others, kudos, feel good factor, education, awareness of great causes etc. This is perhaps harder to qualify directly as many of the rewards are personal or social or psychological rewards. However I do know that lots of my own friends, family and co-workers would like to give more money but simply do not have the expendable income to allow it. So rather than sitting in front of your computer having advertising thrown at you on every inch of the Internet for companies you don’t care about, why not simply learn about a charity and its work whilst raising them cash and for any donor videos simply say “OK - I volunteer. I want to learn. Teach me. As long as you help a worthy cause in exchange.”. Also the very nature of campaigns will mean you won’t be watching crap. Successful campaigns, like on all crowdfunding platforms, will need to be well crafted, interesting, informative and engaging for users to want to share and help in the first place. Nobody. That’s the point. A market place where everyone gets something back. Tada. If you are interested in any of the ideas that I have talked about or want to get in touch about helping, launching a campaign etc then send me a tweet @jimhilluk.